Louisiana –-(Ammoland.com)- The Louisiana Department of Wildlife and Fisheries (LDWF) Enforcement Division is asking the public for help about deer hunting and trespassing violations that occurred in Rapides Parish on Nov. 22 2014. 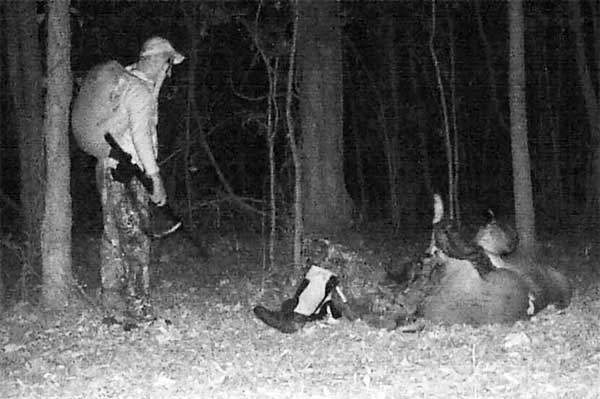 A landowner alerted agents about a photo that his game camera took of two men with deer at 8:37 p.m. on Nov. 22 2014 in the Kolin and Effie area of Rapides Parish. In the photo one man has a deer draped around his back to haul it out of the area and the other man lying on the ground to drape another deer to his back for transportation. LDWF is offering up to a $1,000 reward for anybody that volunteers information that leads to an arrest and conviction in this case. Anyone with tips or leads can call LDWF’s Operation Game Thief’s (OGT) toll free hotline at 1-800-442-2511 or text LDWF OGT by texting LADWF and their tip to 847411. Tipsters can also download the LADWF Tips iPhone and Android apps from iTunes and Google Play stores free of charge. Agents believe that the men were trespassing on private land without permission and may have committed other deer hunting violations such as hunting during illegal hours and with lights or night vision.